Spearhead Glacier is just east of the Whistler-Blackcomb Ski area in sw British Columbia and can be reached easily from the top Blackcomb lift. Adjacent to Spearhead is Decker Glacier . Both glaciers flow northwest and have retreated extensively. Recently both have developed new alpine lakes at their termini that illustrate the recent increase in retreat that could continue thanks to these new lakes. 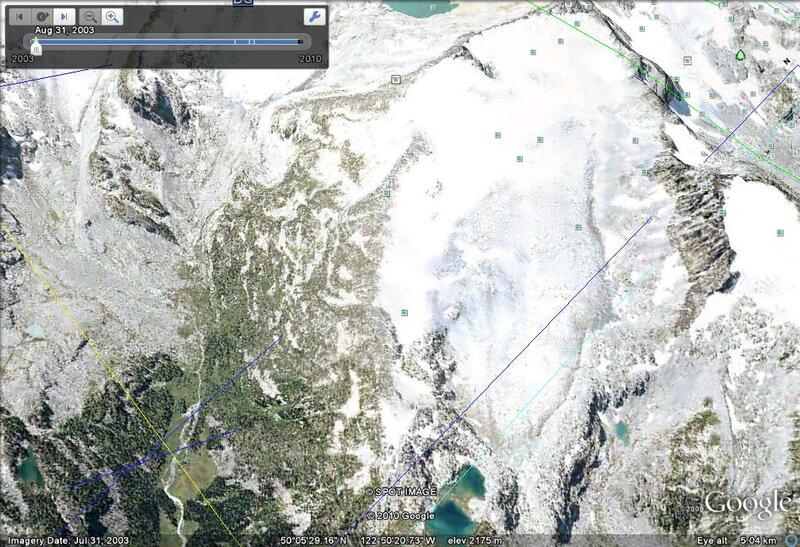 Spearhead Glacier has retreated between 500 and 600 meters since 1928. 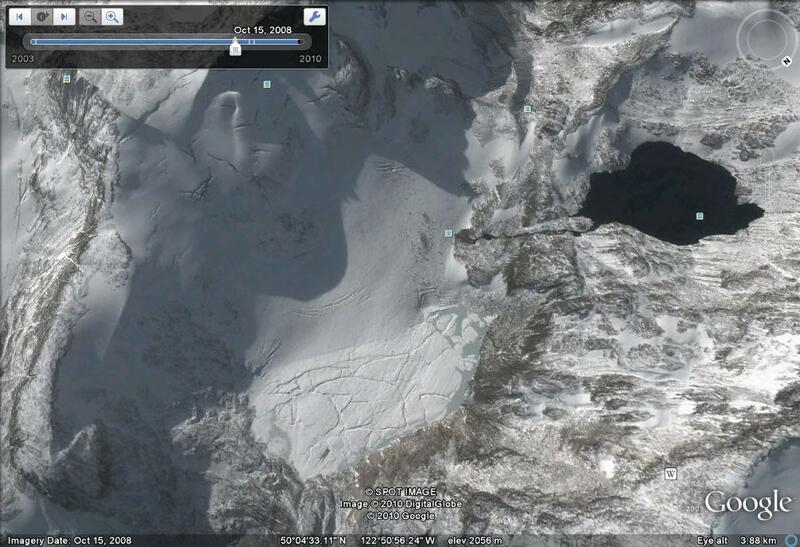 The glacier lost 62 m in mean thickness since 1928 Koch and others (2009) found. A map of the region indicates the extent of the glaciers in the range from the Little Ie Age and today Osborn and others (2007). The first image is from 2003, the low sloped glacier has few crevasses and end in a gently sloping terminus at the edge of the bedrock basin. 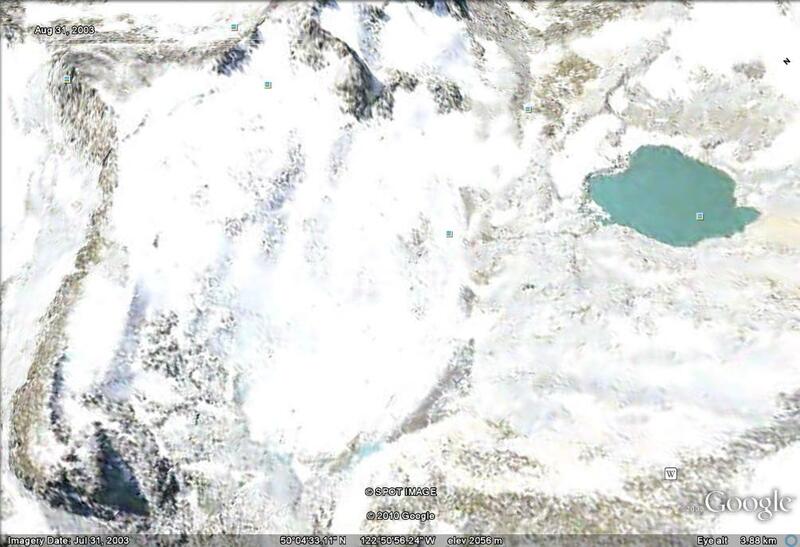 Notice in the fall 2008, second image, that a new lake has formed at the terminus Spearhead Glacier. This lake is expanded further in 2009 as seen in this view below across the lake back at the glacier. 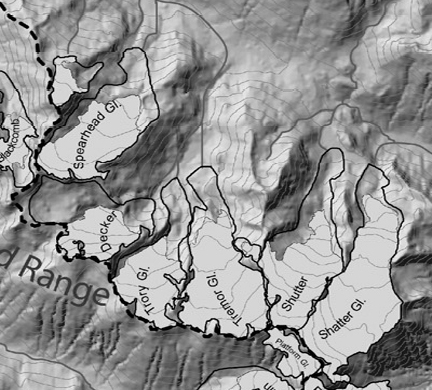 This looks much like the expanding lake view and stagnant terminus area of Colonial Glacier in the North Cascades. The glacier is largely confined to a single basin, that suggests the potential for considerable lake expansion as the glacier retreats. There is a step in the glacier in the image above, that indicates the likely maximum extent, notice the bedrock step on the right side of the glacier. 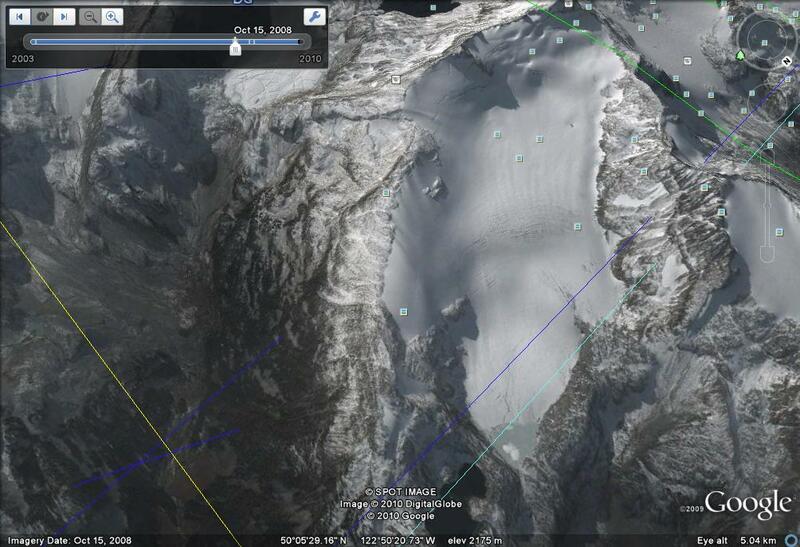 Decker Glacier retreat is even more substantial as a percentage of glacier area. illustrated in a comparative image from Osborn and others (2007) The glacier has also developed a new lake, leading to the breakup of a portion of the end of the glacier, notice the rifted ice pieces in the image below from October 2008. That was not present in the lower image from 2003. This area of broken ice at the end of the glacier and near the image bottom, represents nearly a third of the total glacier area. It is not as apparent as it is in summer conditions when the lake is not frozen over. 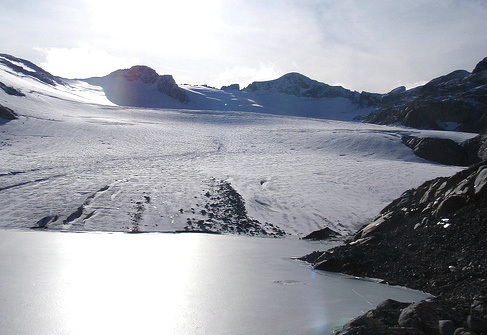 This entry was posted in Glacier Observations and tagged blackcomb glacier retreat, british columbia glacier melting, British Columbia glacier retreat, decker glacier retreat, spearhead glacier retreat. Bookmark the permalink. 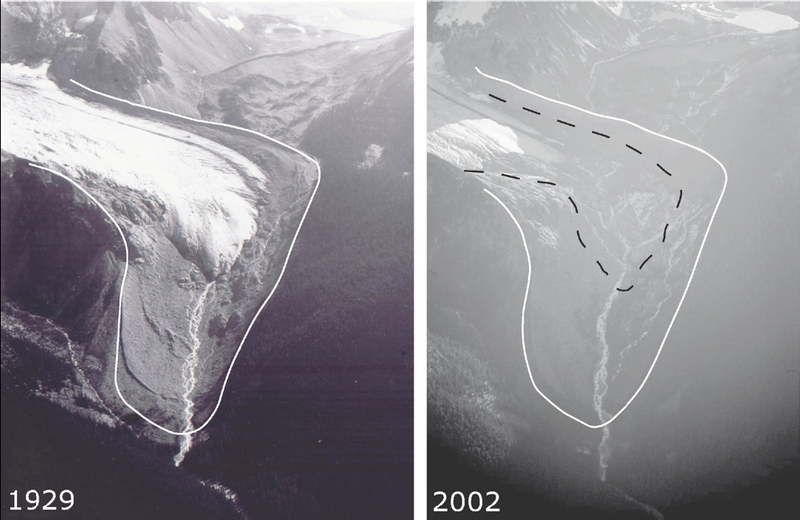 Zongo Glacier Retreat, Bolivia 1994-2014.